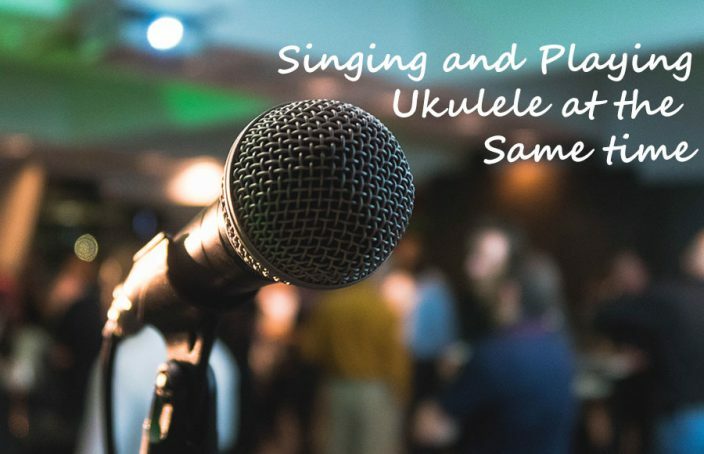 For many of us who pick up the ukulele it is not enough to just play, we also want to sing! While there are specific vocal techniques used in singing, in this article we are going to discuss a few pointers on how to start singing along with our uke. What is most important isn’t just an ability to sing, but a will to sing. A great singer works on their voice for many years, but in the very beginning they had to have the confidence to just do it. And think about this, some of the most famous singers out there really don’t sound all that great. Some singers are raspy, some sound like they are heavy smokers, some sing quietly, the key is they sing. It isn’t always necessary to have a great and trained voice, instead have a confident and maybe even a unique voice! Are You in the Right Key? It is a matter of trial and error in finding which key and notes fit your voice. You can try using a chromatic tuner by singing into it, making note of any notes that commonly pop up. If you are finding your voice fits the Key of E you can always tune your uke up a step from GCEA to ADF#B, that way the E chord is easier to play. You may also discover that your voice is more fitting of minor chords rather than major chords. Perhaps your vocal abilities are more suited to ballads and sad songs rather than upbeat major chord pop. When it comes to singing there is no one size (or key) fits all. Play Plenty of Songs on the Ukulele! One of the easiest ways to figure out what key you sing best in is by playing a lot different songs. New, old, and any genre of music is worth trying, especially if it’s a song you like. Songs you like will be easier to play and you will know if you are singing them correctly. Plus, playing a ton of songs is great for learning new chords and progressions on the uke. After awhile you will start to hear what sounds best for your voice. You will also learn a valuable lesson on what songs work on the uke, and which ones do not. If you come across a song that just doesn’t sound right as you sing it, work on transposing it in different keys that may be more fitting. You will not only learn what keys are perfect for your voice, you will become very adept at music theory. Before playing a new song listen to it a few times over, later try to play along with the uke paying close attention to all the chord changes. Also it helps to have a lyric sheet in front of you while playing. Remember sometimes on the web chords and lyrics aren’t correct so make sure you are playing a song that was chorded or tabbed correctly. Your ears are your best friend. If it doesn’t sound right, well you will have to troubleshoot to find if it is a matter of key changes or something more. When it comes to singing and playing an instrument at the same time, the simpler the playing the easier it will be. In most bands one player will focus on the rhythm while another will focus on lead melody lines and solos, it is usually the rhythm player that does the singing. As you are first learning to sing keep that complicated uke fingerpicking at a minimum. Use simple up and down strums and make sure your chords change at the right times with the lyrics. As you progress in memorizing the chords and lyrics than you can start practicing more intense playing. My favorite way to learn to play ukulele and sing at the same time is by writing my own music. You can create your own verses, a chorus, and a bridge using popular chord progressions or simply your own musical creations. As you write your own tunes it will become very apparent what keys and notes sound best with your voice. Eventually you will discover what your vocal range is allowing you to write songs that suit you. In fact, composing your own songs, tunes, and ditties is the ultimate test of any musician. It puts all of your music theory, technique, and vocal abilities to the test. Just because the uke has a high pitched sound does not mean your voice has to be high pitched. Some men can sing high pitched others can’t, don’t let that worry you when it comes to singing with your uke. I discovered early on that a baritone ukulele was easier to learn to sing with, perhaps a female would find it easier to use a soprano or concert. I now have no trouble singing along with my soprano. When you first start figuring out which keys sound best with your voice, make sure to practice in as private an area as possible. That is the biggest hindrance to vocal training, being shy or worried you sound bad. Yes, we all eventually want some feedback, but initially practice on your own. If your voice isn’t the greatest, who cares just go with it. With confidence and a little bravery, we all have the potential so sing with our uke.